Strange Allies in the War on Carbon Fuels. What great cause could unite Prince Charles, President Obama, the Pope, the Arab Oil sheiks, the United Nations, the European Union, the Russians, the Chinese, Pacific Island Nations, most undeveloped countries, the glitterati of Hollywood, left-wing politicians, unrepentant reds, government media, the climate research industry, Big Oil, Big Gas and the Green Blob. It must be something posing a clear and urgent danger to all humanity? No, the crusade that unites them all is the War on Carbon Fuels, focussed mainly on that most vilified target, coal. 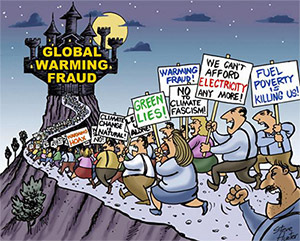 The biggest group, and the generals in this war on carbon, have no real interest in the facts or science of global climate change – they see climate alarmism as a great opportunity to achieve their goal of creating an unelected global government. They have even laid out their plans in a document called Agenda 21. This group naturally includes the United Nations and all of its subsidiaries, the EU, and left wing politicians and media everywhere. At a news conference in Brussels recently, Christiana Figueres, executive secretary of U.N.’s Framework Convention on Climate Change, admitted that the goal of environmental activists is not to save the world from ecological calamity, but “to change the economic development model” i.e. destroy what is left of free enterprise and private property.